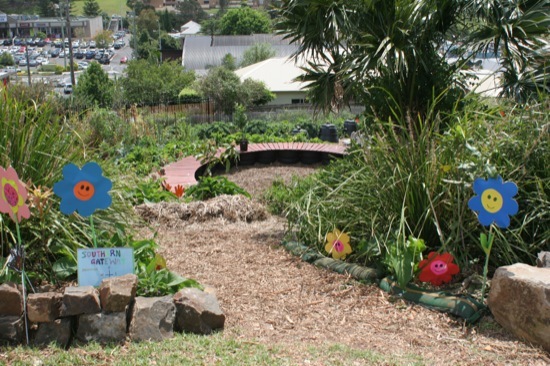 This post follows on from Kiama Primary School Garden Opening. 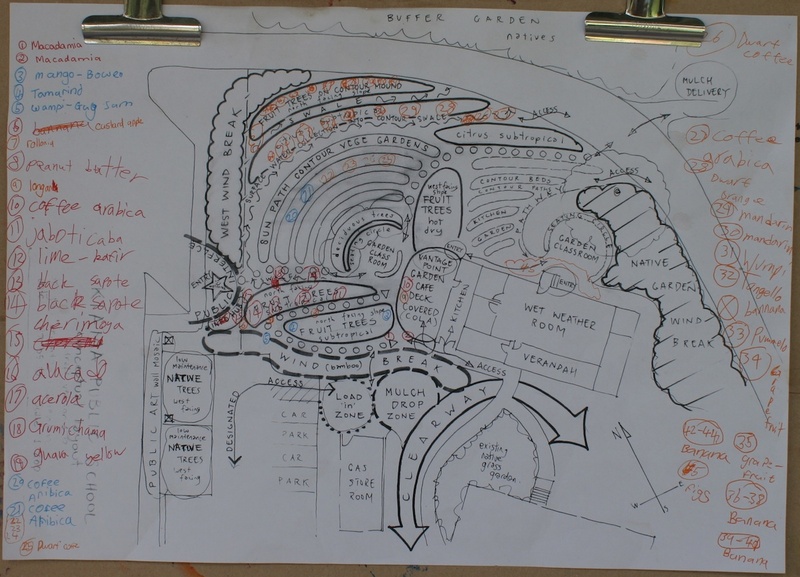 This drawing shows the original design plan for the Kiama Primary School permaculture garden, put together by Aaron Sorenson. It’s not exactly how the garden worked out (they never are! ), but the general placement of the elements is pretty close. It gives a good overview of the site, buildings, access paths and roads, etc that Aaron had to work with. You can click on the photo to see a larger version, big enough to read the writing. 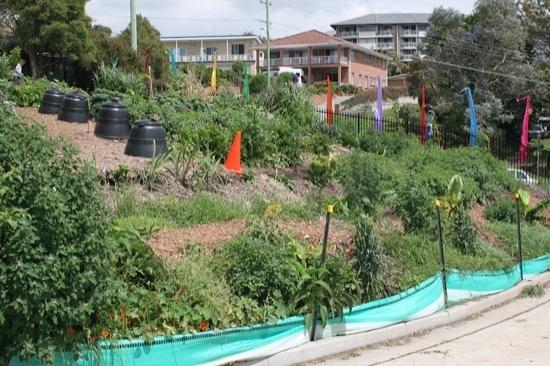 I really like looking at these kinds of permaculture designs. They’re full of ideas to borrow, and you can see how the designer has placed things relative to each other, using site properties (slope, aspect, views, winds, sun, access, etc) to their best advantage. When looking at a plan, I like to imagine how the various jobs would get done in the garden (mulch delivery and application to beds, watering, composting, harvesting, cooking, relaxing, planting out seedlings from the nursery area, and so on). How far would you have to walk, and is it uphill or downhill? How long would hoses have to be to water every plant? Is it far from the regular-picking plants to the kitchen? Would you have to barrow compost very far, and could a wheelbarrow get through to every area? How far would you have to carry tools? 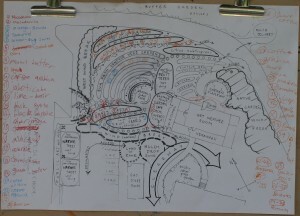 It’s also useful to think about rain on the site, where water will flow, and how it will interact with swales, paths, and other garden elements. With all that in mind, lets get on with the tour! First, the top entrance. This is where people enter from the school. Just to the left of where I took the photo is the car park and an access gate. 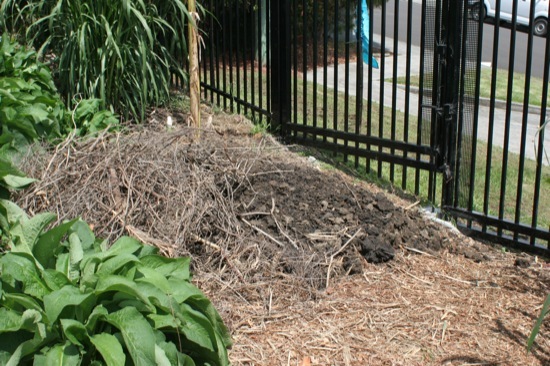 That area serves as a mulch drop point – nice, since you only have to wheelbarrow it downhill! The entrance invites you to enter and follow the path down to the main seating circle. The path down from the main entrance is gently sloping, built as a switch-back down the side of the hill. Besides being easier to walk up and down, it slows water flow during rain and prevents erosion. And how about that ocean view! The paths/swales across the hill have been lined with lots of comfrey. This is a hardy, deep-rooted and fast-growing plant, so it stabilises the banks. Because it has such long roots, it “mines” nutrients and minerals from deep down and brings them to the surface, storing them in its leaves. The leaves are regularly harvested for compost and mulch, and it can also be used to make “comfrey tea” fertiliser or fed to livestock. You can’t see it very well in this photo, but there are banana plants and other fruit trees in amongst the comfrey. 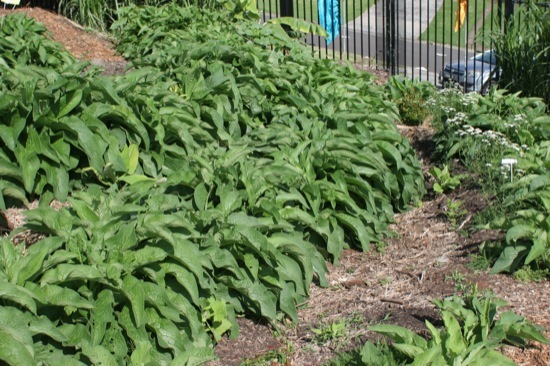 These are mostly shallow-rooted plants, so the comfrey doesn’t compete with them for nutrients. And that brings us to the seating circle, about half-way down the slope. This is a large level area, with enough seating for a whole class and plenty of room in the middle for demonstrations. Being central, you can also see most of the garden from this vantage point. What a great learning area! 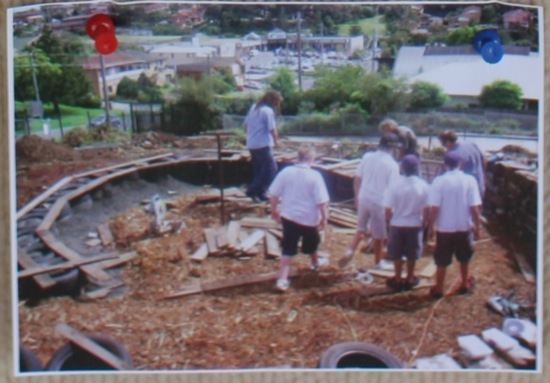 The next three photos are from a display board at the school, to show a bit more detail about how the seating circle was constructed. 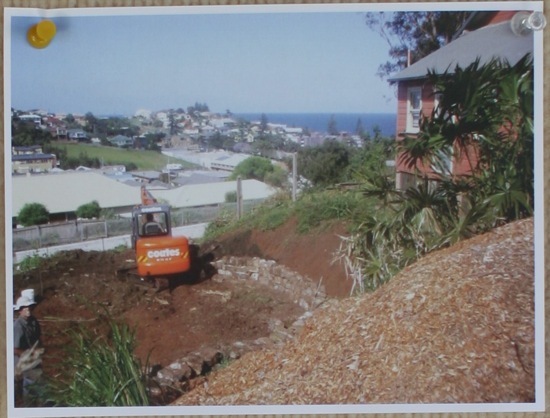 It started off with earthworks to level the site, and construction of retaining walls (which provide additional seating if needed). 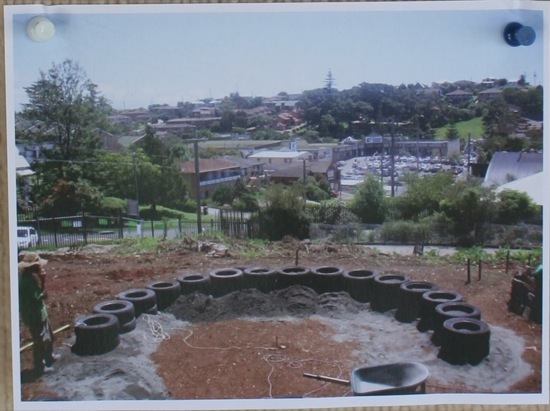 Next, a base was put down and tyres were put in place as the structure of the seating circle. The tyres were filled for structural strength and stability. Boards were fixed to the top of the tyres as a base for the decking timber of the finished seats. This area between the schoolhouse and the seating circle is a north-facing slope, but is protected from southerly and easterly winds by the buildings. That makes an ideal environment for south-east Asian vegetables. Below this area is the Mediterranean area, also a north-facing hot area. Don’t you love the signs the kids have made? 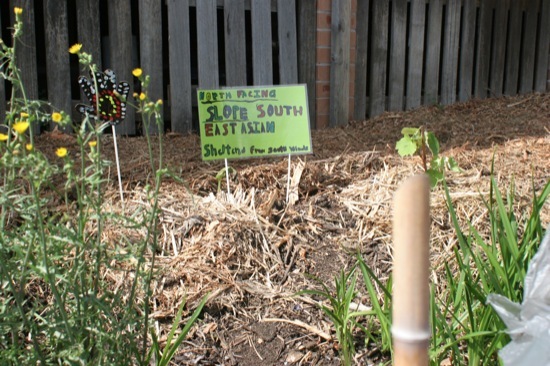 They were dotted around the garden to identify various features, plants, microclimates, etc. About half-way down the slope is the public entrance to the garden, leading in from the footpath. This also serves as a secondary receiving point for mulch, compost, etc. In a little from the public entrance is the main composting area. Being a large flat area right near the entrance, it would make a good place for stacking bulk materials like hay bales and garden stakes, before distribution around the garden. 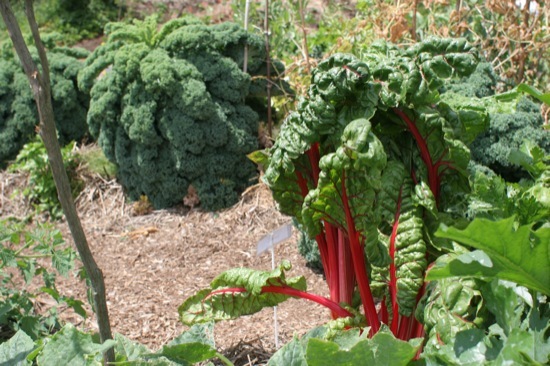 Near the composting area were some striking rainbow chard plants. You can see the huge curly kale plants in the background too. Doesn’t everything look super healthy? 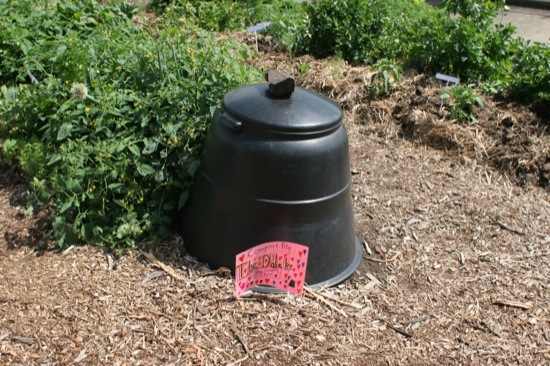 Dotted around the garden at the end of swales are these compost bins, dubbed the Daleks by the students. You’re never far from one of these, making it very convenient to get rid of prunings, dropped fruit and other waste while working in the garden. They are the Gedye compost bins that are available from Kiama Council. Moving further down the slope, the kids have planted a wind break to provide some protection against the salty coastal breezes coming in from the east. 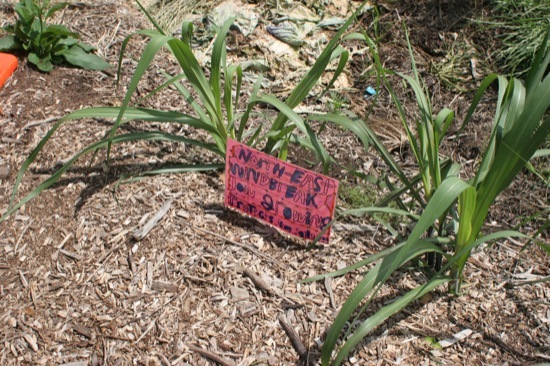 There are a few windbreaks around the garden, mostly either bana grass or sugar cane. Both grow quickly to about two metres tall, and can be cut for mulch or composting. The bottom of the garden (the northern edge) is bounded by the school’s service road. This would reflect a lot of heat on a sunny day, being light-coloured concrete, so the lower part of the garden needs to be planted with species able to handle it. The kids have designated this bottom swale the citrus mound. Looking back up the slope at the schoolhouse. The main garden is to the right in this photo, and there’s native gardens continuing along the slope to the left. 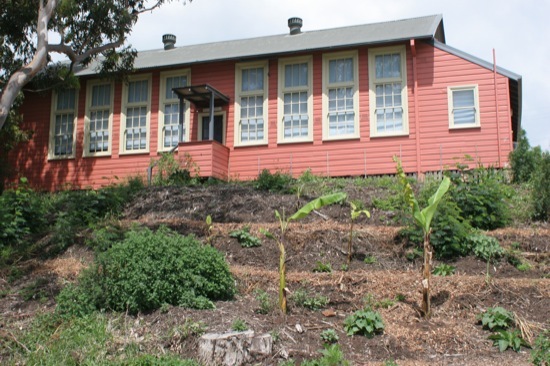 These swales have been planted with bananas and other fruit trees, and also provide a pathway back up to the schoolyard. I hope you enjoyed this tour as much as I enjoyed visiting the garden! Hello. Darren left a really interesting comment on my blog so I wanted to drop by to return the blog visit. You have some wonderful posts here. Well done. The school is a jewel. This is learning by doing, the very best kind. 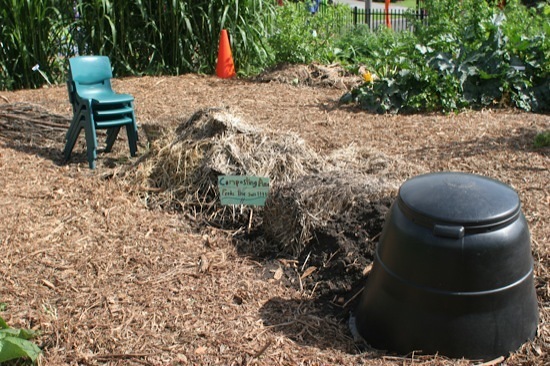 Love the idea of the compost bins at the ends of the swales. Very convenient. And the signs! Precious. @Leigh: Isn’t it bizarre how bureaucracy can get so dysfunctional? Fresh, organically grown food isn’t “safe”, but Twinkies are! Thankfully our governments in Australia haven’t gotten that bad yet, but we do tend to copy a lot from America so we need to be vigilant. 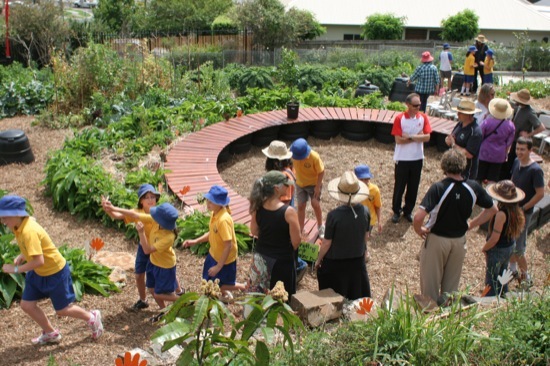 In our schools, the kids eat from the gardens. The produce is used as the basis for teaching safe and healthy food preparation and cooking. 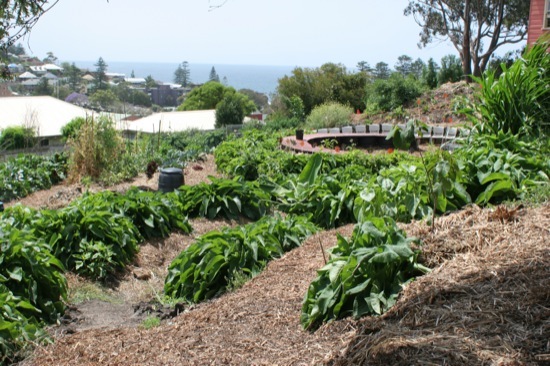 Stephanie Alexander (an Australian celebrity chef) is doing wonderful things here – check out her Kitchen Garden Foundation for lots of great ideas.